Bingo Love is a sweet and heartwarming story about a love story between two women than spans over 60 years. The story begins in 1963 at a bingo hall, as two thirteen years olds are introduced to one another by their grandmothers. Told from the perspective of Hazel Johnson, a pretty and plump teen, she is immediately attracted to the cool California transplant Mari McCray. The two girls become inseparable best friends throughout middle and high school, but Hazel (also known as Elle) keeps her feelings to herself. Only when their closeness is looked upon with suspicion from their family, does Hazel first kiss Mari, and finds out the feeling is mutual. Spotted by Mari’s grandmother, the girls are shamed and quickly separated, with each girl being forced into early marriages to save face. 48 years go by from their separation, and we are given a quick montage of Hazel’s life over the years with her husband James, a veteran of the Vietnam War, and their three children and families. Although Hazel has a deep affection for her husband, and adores her children, the marriage is empty of real love. When Hazel and her daughter and two daughters-in-law head out to their annual Mother’s Day bingo game when across the church hall, Hazel sees Mari for the first time in close to fifty years. Mari spontaneously kisses her in front of everyone, and Hazel’s quiet life is upended. Mari and Hazel reconnect and we find out Mari is a lawyer and still married herself with five children, but is willing to divorce her husband immediately for Hazel. While Hazel’s feelings are still as strong as ever for Mari, she is unsure about making such a radical change herself. She eventually does tell James, and we learn there are additional secrets in their marriage, and their lack of sexual life comes into focus as to why. The conclusion of the story does have Hazel and Mari marrying and their children to coming to terms with their mothers’ new relationship. The two women have several happy years together, but old age is harsh for Mari and their time together is eventually cut short. This bittersweet but realistic ending was poignant, but the last page will make your heart happy. The artwork is a joy. It is bright and colorful, and gives a wide representation of skin tones and body types in the black community. I admired the outfits the two women wore through the years, and the backgrounds that included the homes and larger communities were fun to look at. 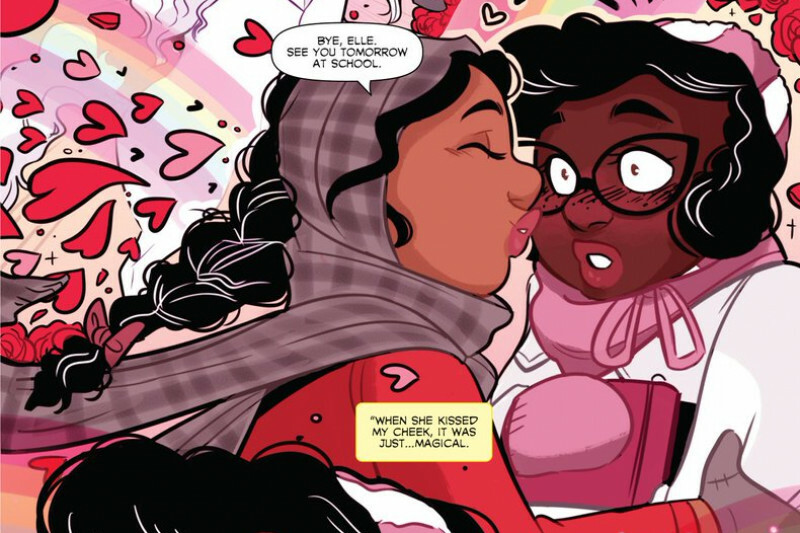 While I truly enjoyed this story and think it is perfect companion piece to Love is Love (in fact author Tee Franklin contributed a story to the anthology), there are a few missteps in this story. At only 92 pages, it felt unnecessarily rushed in spots, and could have been longer. I believe that their teenage friendship (all we were given was a two page spread) could have been expanded, in addition to Hazel’s later family life. Plus by choosing to center exclusively on Hazel, we had no insight to Mari’s life which left a huge void in the narrative. Hazel experienced almost no fall out from her reveal to her husband, and used terms that a grandmother would not say to explain her coming out. The secret that James referred to (we all can guess what it was at that point) felt like an easy way out of the marriage, and sucked the gravitas out of a story that tried to be realistic as to what women of that era endured. I was pleased to be able to obtain a digital copy of this graphic novel from Edelweiss for an honest review. Despite my few criticisms of the book, I still believe it is a solid book and want to pick up a print copy and add it to my library’s collection. The diversity shown in the story is much needed and deserves much praise. More books like this please! We should pick a book that we both want to read and do a compare & contrast from both our perspectives! Which book shall we pick??? Overall a sweet love story with cutesy artwork. I’m glad to hear that someone else thought the same things. While the book is very worthy, it is only fair to point out that it wasn’t perfect. People, with all the prejudices and judgements taught to them from a young age need to read about more diverse lives than the one man, one woman scenario. Then we’ll have less hate crimes and verbal put downs with all people becoming an equal part of our society. This is a beautiful story. It certainly was a lovely and needed story!